Barefoot with a Bodyguard is a romantic story filled with suspense and set on the magical beaches of Barefoot Bay. 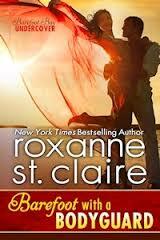 This was my second time reading a book by Roxanne St. Claire and I really enjoy her addition of mystery and danger into the books, however I did not enjoy that the story was written with more than two point of views as it sometimes made it very confusing and difficult to read. I enjoyed Alec's character because he did not just give into his dark past, he actually fought to become a better person. Kate's character was kind of annoying especially her whole whining about not wanting be controlled by a man and at the first chance she got she went back into her old patterns. The chemistry between Kate and Alec was steaming hot and I enjoyed watching Alec trying to fight his attraction towards Kate. I loved all the drama going on in the book especially towards the end as it made the book more interesting because towards the middle it had gotten slow and boring which resulted in me taking longer to finish the book. Overall this is a good book and I would definitely be interested in reading the rest of the book. Kate Kingston, has just ended her five year marriage, and now craves independence and a long vacation, but she is now facing threats against her which have been showing up in her dads office. She then goes to Barefoot Bay to get some sunshine and learn for her upcoming bar exam, that is until she meets the handsome muscle man her father has hired to protect her, Kate starts feeling that her independence is being taken away from her again by men who wield power in her life. Alec Petrov is a mixed martial arts trainer who has been on the run from the deadly Russian mafia since he was a teenager. Protecting a young attorney in a tropical paradise is not a bad way to get of the grid of the Russian mafia. Kate ends out bring a tender and caring side of Alec that was never seen before. Alec begins to find it difficult to keep his hands off Kate while staying in close quarters, but that is only half the challenge as he has to fight to keep them both safe as well.